New to NZ docking system lacks the bells and whistles, but does that matter when something sounds this good? SOMEWHERE IN THE depths of my storage locker is a collection of Hi-Fi World magazines dating back to the late ‘80s. To flick through the pages of these issues is to delve into the history of the hi-fi game, particularly the story of the United Kingdom’s audio industry. There are brands that have vanished, some that fell on hard times and then returned under new ownership and others where it’s been business as usual for decades. Ruark is a brand that I recognise, despite having never heard a set of its speakers. Many years of reading British hi-fi magazines have given me a mental picture of Ruark being a manufacturer of traditional speakers – lots of rectangular cabinets with classy looking wooden veneers. Much like Castle, the brand was quintessentially British, with speakers carrying names like Sabre, Broadsword, Templar and Crusader. How could it be otherwise? Ruark Acoustics was formed in 1985, so there’s nearly four decades of experience in the company. Some of the current range of speakers would look quite familiar to anyone who knew the brand back in the day, but some of the newer designs are quite a departure in terms of style. The Ruark Audio sub brand is the biggest departure of all, but a speaker company going into the compact and tabletop radio/dock segment is nothing new. These units were branded Vita Audio before they became Ruark Audio, but they’re the same devices. The R2i model tabletop radio is by no means a new product. In fact, it was originally launched in 2007, and won the What Hi-Fi Product of the Year. 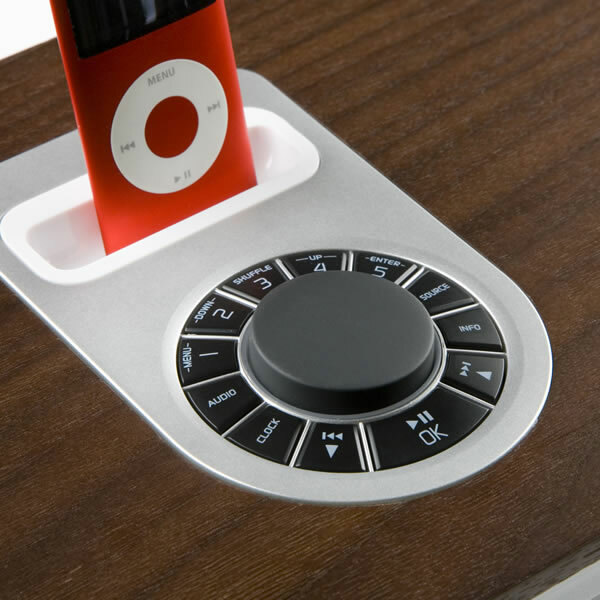 The R2i model as reviewed here was launched in 2009 with an integrated iPod dock, extra power and other technical enhancements. So why are we reviewing a product dating back four years? Because Ruark Audio is finally available in New Zealand, and the R2i is very much a current product in Ruark’s stable, which means that Kiwi punters will see it on the shelves and need to be able to find some local information about it. Unlike some of its competitors, the R2i is pretty simple in its interfaces to the audio world. There’s no Wi-Fi, Bluetooth, AirPlay, USB, digital inputs or newfangled bits and bobs. 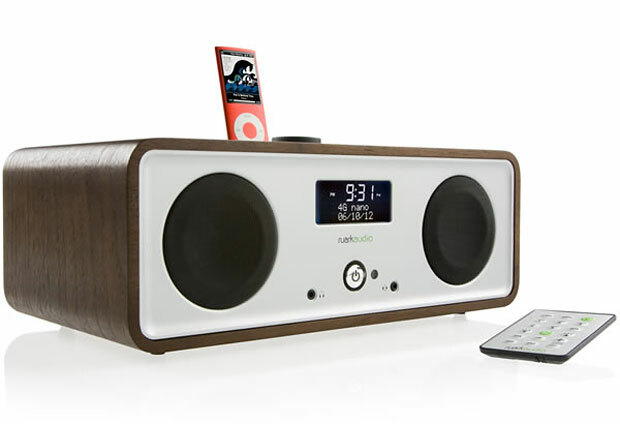 There’s a DAB tuner (a standard which is relatively new to NZ) but otherwise, the R2i plays music via an FM tuner, Apple dock, front mounted 3.5mm or rear mounted RCA aux inputs. This selection will suit the listening habits of many consumers, so it’s not a major negative in my book – those who want all the bells and whistles will choose an appropriate dock-based speaker system. 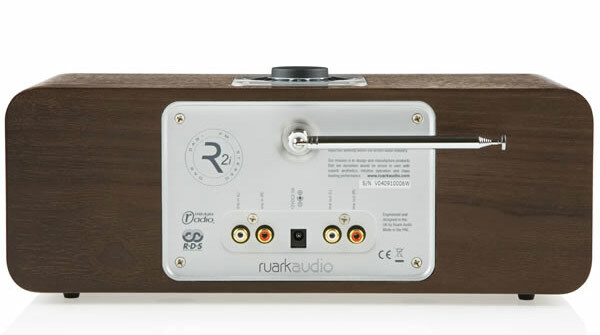 In addition to the audio aspects, the R2i offers clock and alarm functionality and a 3.5mm headphone jack. The R2i is nicely built and while it’s a familiar looking design, the curved shape looks elegant and subtly discreet in the matt brown, black and silver finish. The display is bright and easy to read across the room, but while the top mounted control panel is clearly labeled and easy enough to use, it isn’t backlit or illuminated, bar a blue glow around the centre knob. Said knob looks like a jog dial but it isn’t – so instead of being able to twirl it back and forth to change the volume or adjust through settings, it only rotates about 45 degrees to adjust volume like a switch. And it doesn’t do much else. The actual menu navigation is done via the buttons on the pad, which works well enough once you get used to it, but is a little counterintuitive. You can navigate the menu structure of a docked iPod from the R2i’s control panel but the dock is inches away, so I found it simpler to just do it on the Apple device or the remote control. You need to be careful though, because Ruark doesn’t supply adapters for the dock, so the iPod or iPhone is precariously sticking out of the 30-pin connector with no support at all – an accidental knock or a careless swipe and the game may be over for ever. Some Apple devices have apparently been shipped with the appropriate adapters but of the four Apple product boxes that I had access to, no adapters were found. The R2i manual states that adapters are available from Apple stores or online – this omission strikes me as bizarre when it comes to what is a seven hundred dollar unit designed expressly to dock Apple devices. If you bring home an iPhone 5 or a new iPod Touch, it’s not going to like the R2i, and while you could run it from a 3.5mm cable, that’d be a total waste of the capabilities of both units. According to Ruark, this 30-pin-to-Lightning adapter cable will work, but then you can’t really “dock” your iPhone 5 or Touch, it’ll just sit on top of the R2i, which isn’t ideal but probably isn’t the end of the world. Still unless you’re quite sure, then caveat emptor – make the right decision before parting with your cash (or wait for the release of a unit from Ruark that’s Lightning compatible – like everyone in the industry, the company will be scrambling down that track in a hurry). Setting up the R2i for a run-in, I popped it on the dining room table with Calexico’s Carried To Dust album playing from my iPod Classic while I chopped up a salad in the kitchen. It didn’t take long for me to put down my knife, wash my hands and walk over to turn the R2i up. I liked most of what I was hearing, and considering I’d just turned off my main stereo system, the little Ruark speaker system was keeping my attention very well. The sound was quite open and far more detailed than I’d been expecting given the relatively compact proportions of the R2i and its full-range driver layout. I’ve made that mistake before with B&W’s Zeppelin Mini (reviewed here), which nearly took my head off with seemingly unfeasible volume levels when I first listened to it. However, I was very aware that the bass was too fulsome with a nasty one-note overhang and that the midrange was syrupy rich. I couldn’t see how any self-respecting audio engineer could tune a device to sound like this, so I started figuring out what was going on. I hadn’t bothered with the manual as yet but I noticed that there was an Audio button on the control panel. Could this thing have some kind of evil equalization turned on? As it turned out, my intuition didn’t lead me astray – the EQ was set to flat and the 3D Sound was off but the Loudness was on for some unknown reason, and it was messing up the bass big time. Once I’d defeated the sinister machinations of the Loudness setting, the R2i’s sound became clearer through the midrange and the bottom end tightened right up. From there on out, it was smooth sailing and I the R2i became my default choice for listening to the radio or iPod when I was writing or cooking. The little remote control made life easy and I seldom had to use the control panel. Sonically, the R2i is a smooth performer – it’s not the most insightful speaker system of its type but it’s an amiable listening companion, with bass that goes deep enough to offer meaningful oomph yet stays under control so that there’s a good sense of pace. The midrange is rich and warm and the treble reaches high enough without being harsh. Overall detail levels are good, it’s really quite musical and there’s more than enough grunt for the R2i’s typical environment. Listening to some mellow jazz on a Sunday afternoon, I cued up Chico Hamilton’s The Dealer and found that the R2i gave the sax a nice bite and allowed the bass notes and guitar riffs to flow along easily. Chris Stills’ ‘Landslide’ from the Chris Stills CD also sounded good on the R2i, with the different tones of the percussion standing out clearly and having a good degree of heft. Radio stations were picked up well in my area. Ruark provides a tuning indicator to help get the best signal from the large screw-in antenna – and the broadcast sound was smooth, respectably open and not at all hard to enjoy for long periods. It was even better when hooked up to my hi-fi system via its RCA line-outs for an epic Labour Day public holiday where local station The Sound played nothing but entire album sides from the vinyl all day until midnight. As a source, the R2i sounded more like a high quality tuner than a table radio, all deep bass and warm three-dimensional soundstage. The tuner module in here is more than up to the job. The limited selection of DAB broadcasts didn’t sound as good as FM but the R2i automatically tuned in all the available stations without any hassle. One of the highlights of my time with the R2i was a rainy Sunday night. I was listening to Radio Hauraki while I was whipping up a stir-fry and as occasionally happens, the station played a long set where every song segued perfectly into the next one. As the music went from Guns n’ Roses to Queen to The Black Keys and beyond, the volume button on the remote got tweaked until the R2i was pumping rock into the house at unfriendly volume levels and the cook was having a blast.